AN is proud to sponsor New Practices New York, one of the city’s leading showcases of design talent. We extend our congratulations to this year’s selected firms. Their work are on display at the Center for Architecture. La Casita in Syracuse, NY. 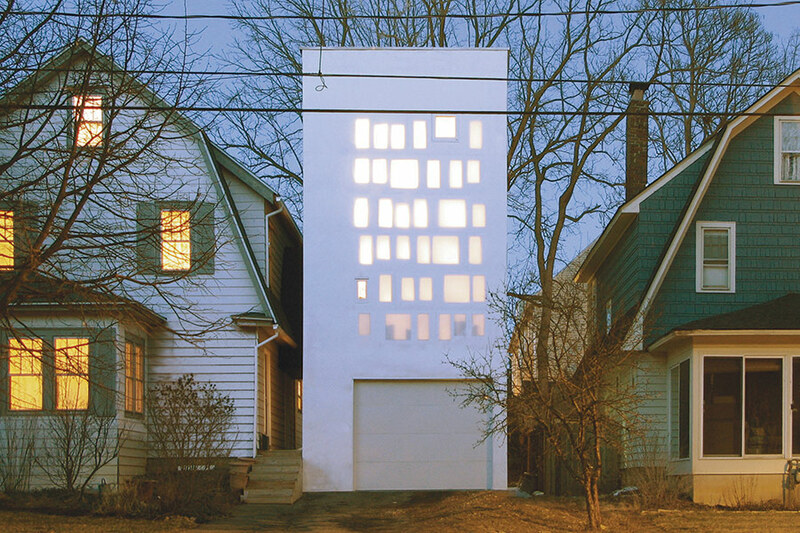 Based in New York, PARA-Project’s work includes cultural, institutional, residential projects, as well as events. The firm is committed to research and multidisciplinary collaborations. Walls of Wax Michael Bastian store for Boffo (left). Ice Palace in Winnipeg (right). 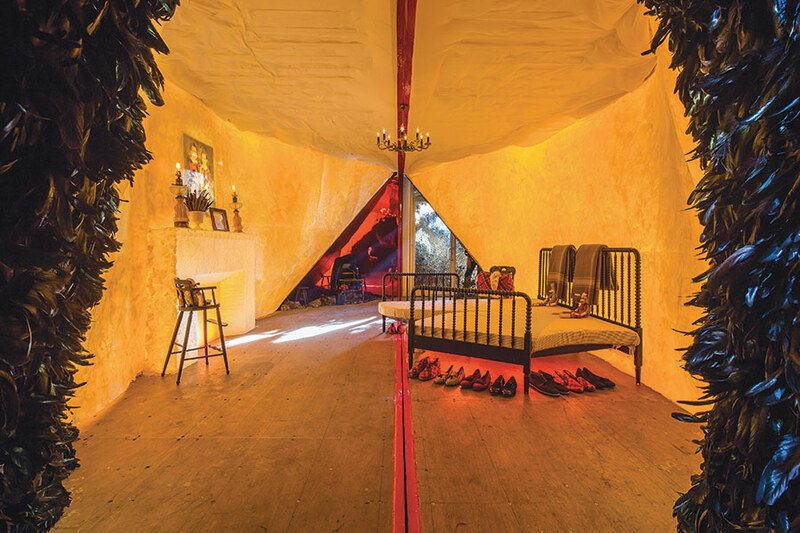 Bittertang is a Manhattan-based studio that seeks to cultivate pleasure through vibrant and unexpected designed environments. Organic and biomorphic forms and unconventional materials are combined to create new kinds of objects and spaces. Principals: Antonio Torres and Michael Loverich. 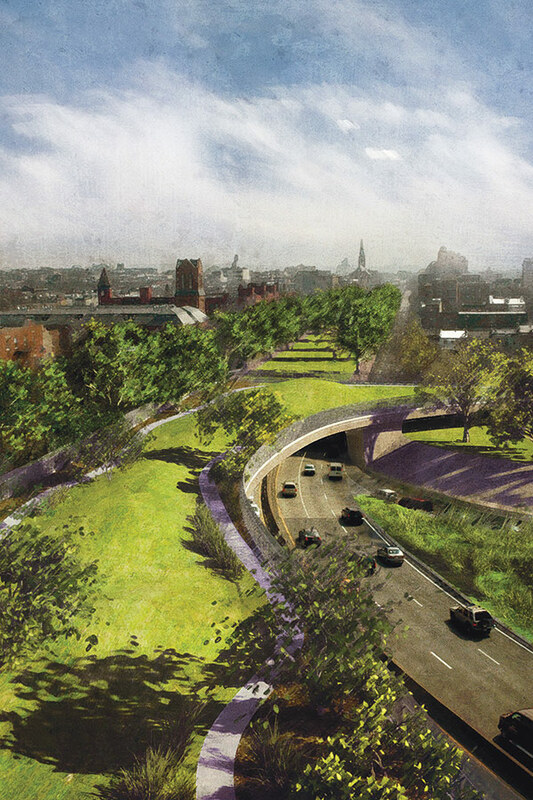 BQE Trench Reconnection Strategies for Brownstone Brooklyn (left). The Gowanus Sponge Park (right). 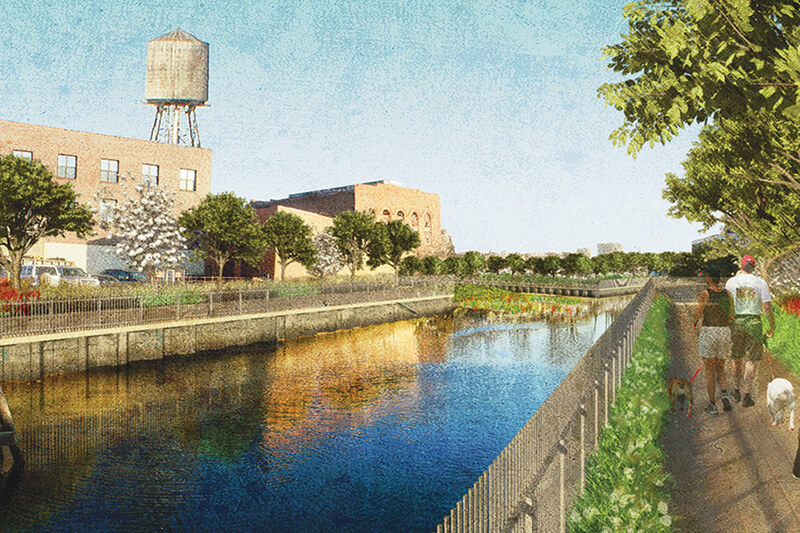 Based in Brooklyn, dlandstudio has been at the forefront of innovative green infrastructure projects, working with public and community groups to develop local solutions to environmental problems. EPS Grotto in Seoul, South Korea (left). 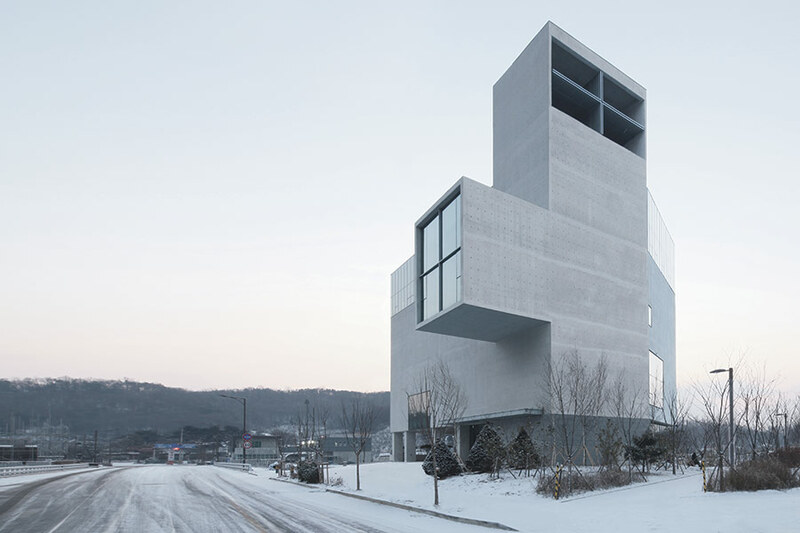 RW Concrete Church in Byeollae, South Korea (right). 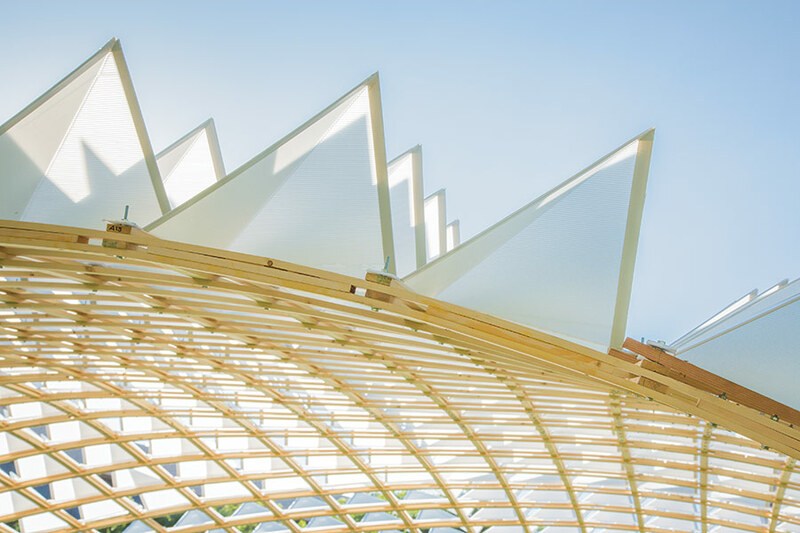 With offices in New York and Seoul, NAMELESS Architecture’s work ranges from temporary pavilions to permanent buildings influenced by Eastern and Western contexts. Principals: Unchung Na, Sorae Yoo, and Kiseok Oh. 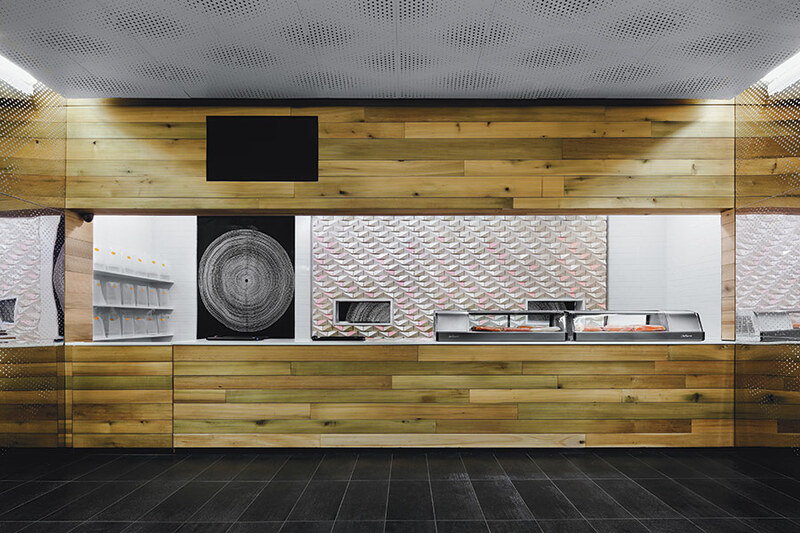 Sushi-teria in New York (left). Brooklyn Mosque (right). 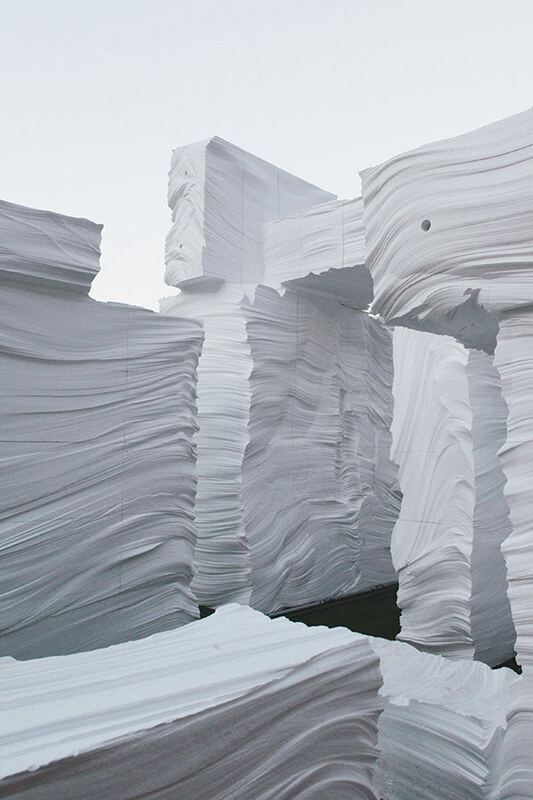 This New York–based form examines the culture of performance and the performance of culture through architectures at a variety of scales, including installations, prototypes, interiors, and speculative urban concepts. Principals: Ajmal Ismail Aqtash, Richard A. Sarrach, and Tamaki Uchikawa. 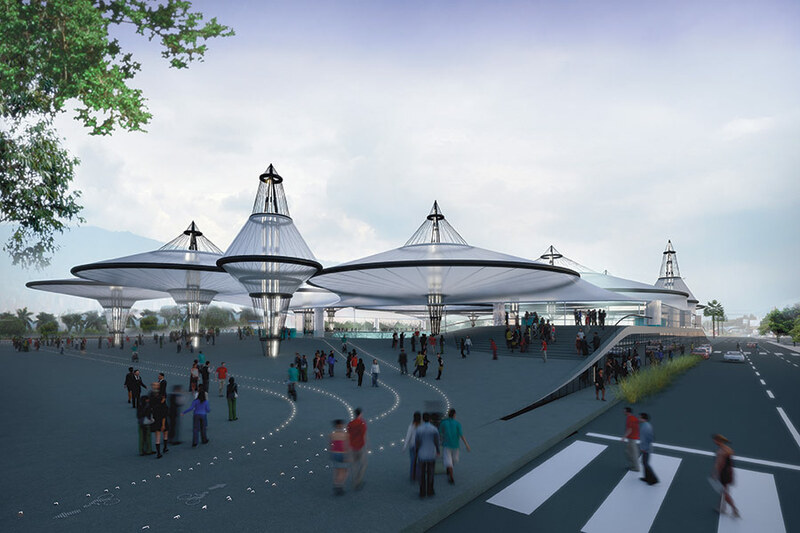 The Street Exhibition in Shenzen (left) Proposal for a velodrome in Medellin (right). With satellite offices in Barcelona, Sydney, and New York, Fake Industries Architectural Agonism is a speculative and provocative studio that extends and blurs the boundaries or architecture. Principals: Cristina Goberna and Urtzi Grau. The recent trend in streetcar reintroductions and expansions across the US have hit a political speed bump. Most recently, on August 5, voters in Kansas City, Missouri, turned down a proposal to expand the funding mechanism for the city’s downtown streetcar starter line to partially fund a $472 million, 7.6-mile expansion project. Backers of the plan hoped that generating approximately half of the total funds would position the City for federal funding. At a news conference after the defeat of the measure, Mayor Sly James did not concede. “This issue is not over by any stretch of the imagination,” he said. Kansas City is not alone. Earlier this summer, the San Antonio City Council scuttled plans by VIA Metropolitan Transit, the region’s transit agency, to build a 5.9-mile streetcar line downtown. Confronted with a strong anti-streetcar backlash, the mayor and city council are tabling the streetcar discussion into the update of its long range transportation and moving forward with a Charter Amendment next May 2015 that would prohibit the City from funding any streetcar project or allowing streetcar’s on their right-of-way without voter approval. Similarly last year in Cincinnati, Ohio, the city council halted $42 million in funding for a $147.8 million, 3.6-mile streetcar project while it was under construction. Then newly elected Mayor John Cranley felt his anti-streetcar stance meant people agreed with him on the subject. An independent audit determined it would cost the city as much to cancel the project as to finish it, and local business leaders stepped in to provide partial funding. But these setbacks are exceptions to the national trend. 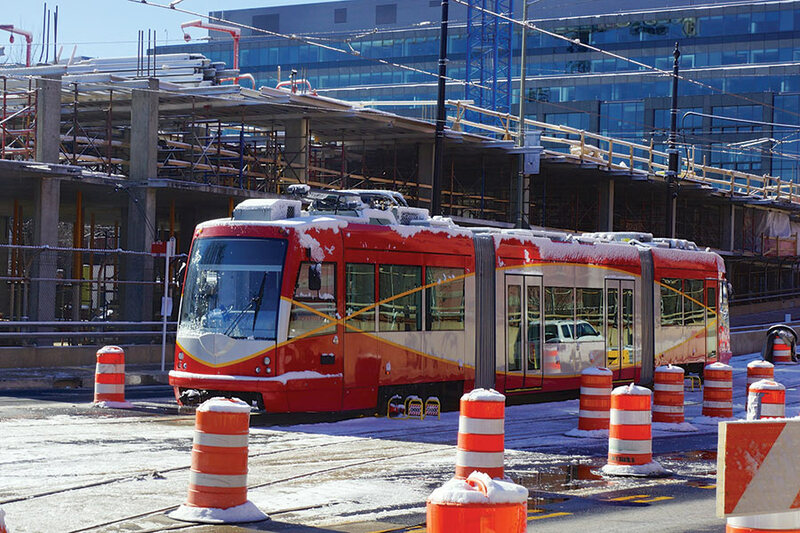 There are over 40 streetcar projects nationwide in stages from planning to completion. The quiet revolution that started over a decade ago in Portland, Oregon, and spread to cities across the country has received significant support from the federal transit administration with the appointment of former Charlotte, North Carolina, Mayor Anthony Foxx to Secretary of Transportation in 2013. Whether used to enhance the identity of an entire community or an individual institution, street furnishings present a primary opportunity to engage the public with design. 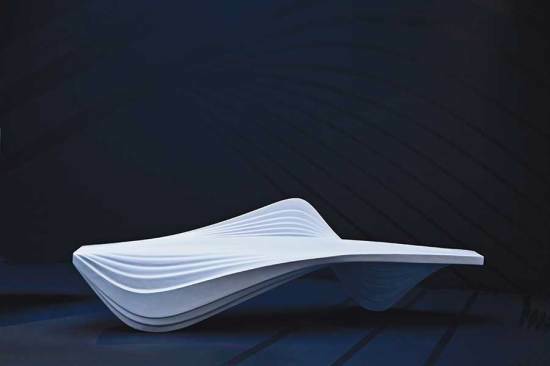 Here's our pick of products—created by Zaha Hadid, Yves Behar, Antonio Citterio, and others—for seating, lighting, and other outdoor accoutrements that have exceptional architectural appeal. Belevedere Spot Double F3 Flos Galvanized aluminum with a coppery finish, this fixture is also offered in a single-head configuration. Designed by Antonio Citterio with Toan Nguyen. MultipliCITY Litter Landscape Forms Defined by a graceful, cast-aluminum spine and top wing, this container comes in one- and two-bin models. Part of a collection designed in collaboration with Yves Behar and fuseproject. Serac Bench Lab 23 With a ridged, curving form inspired by crevasses in a glacier, this bench is made of a matrix of quartz and resin. Designed by Zaha Hadid. Montana Santa & Cole This design allows bikes to be secured at two points on the frame and wheel. Made of AISI 304 1 1/3-inch stainless steel. Model TF7072 Belson Outdoors Made with ¼-inch steel rebar and Portland cement, this ADA-compliant drinking fountain features a second spout and bowl for animal use. Available in numerous colors and finishes, some LEED eligible. Fin Huntco Made of three-inch mild steel flat bar, this bike rack resists pipe cutters. It can be surface-mounted or installed in-ground. Knight Bollard Forms + Surfaces Powder-coated, 43-inch-tall aluminum column light; security bollard optional. Compact fluorescent or HID lamp; wet-location rated. Coda Bench Woodhouse A kit of parts, the basic concrete bench form can be fitted with wood seating platforms and any combination of steel armrests to create consistent yet customized schemes. Designed by Lifschutz Davidson Sandilands. Break 4100 Vibia A 13W triple tube shines through the acrylic diffuser of this 32-inch tall resin-bodied bollard. Rated for wet locations; three finishes. Designed by Xuclà & Alemany. Henge Table HENGE Described as “playable sculpture” by the manufacturer, this concrete table is built to International Table Tennis Federation specifications. In two finishes; steel nets are customizable. Filo Bench StopSpot Extruded, anodized aluminum makes up the seat and backrest of this bench. In 70- and 94-inch lengths, it is lightweight yet made to withstand high traffic. Quartz Series Planters Kornegay Design In natural grey concrete, or custom hues from Davis Colors. In 27-, 30-, 39-, and 45-inch heights. Evelyn's Park will be constructed in phases as funding becomes available. 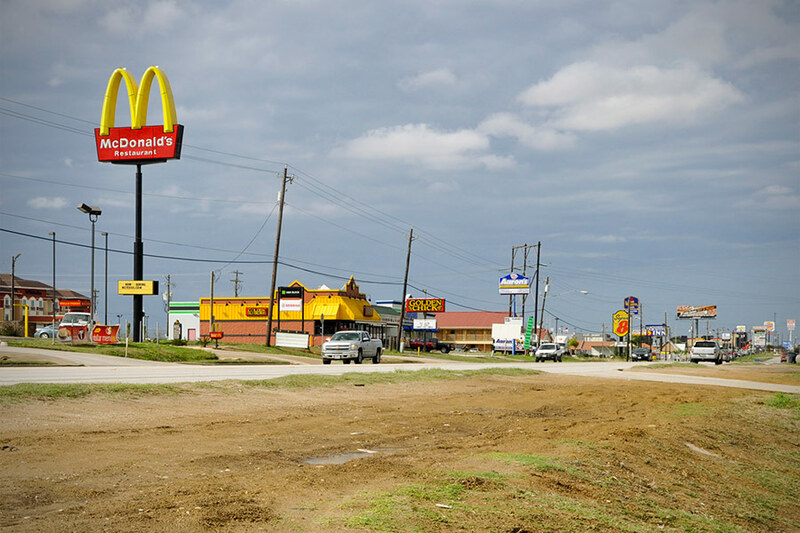 Bellaire, Texas, one of the many smaller cities engulfed within Houston’s metropolitan area, is set to get a new public green space. 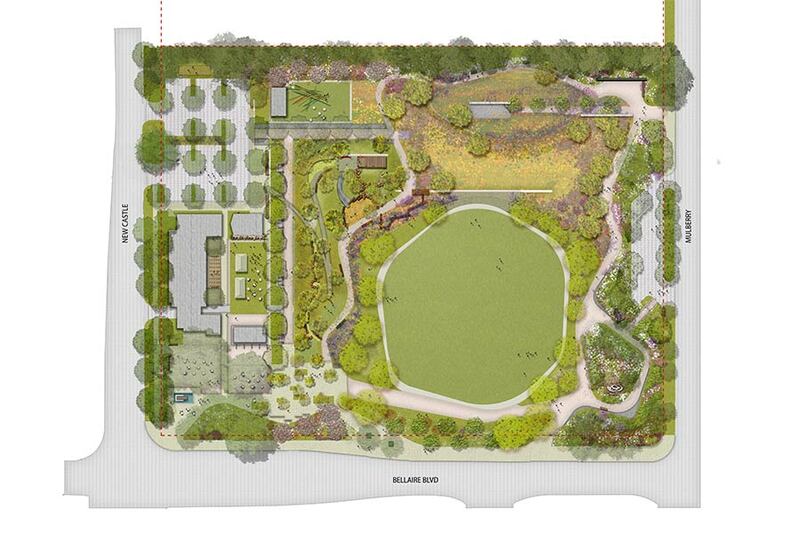 Evelyn’s Park, as it is called, will soon be built on the site of the historic Teas Nursery, formerly located on the 4400 block of Bellaire Boulevard. After years of complicated maneuvering, the project is slowly inching closer to fruition, with construction expected to begin by January 2016. Edward “Papa” Teas established Teas Nursery in 1910. It continued operating on the same site until the death of his grandson, John Teas, just shy of its 100th anniversary. 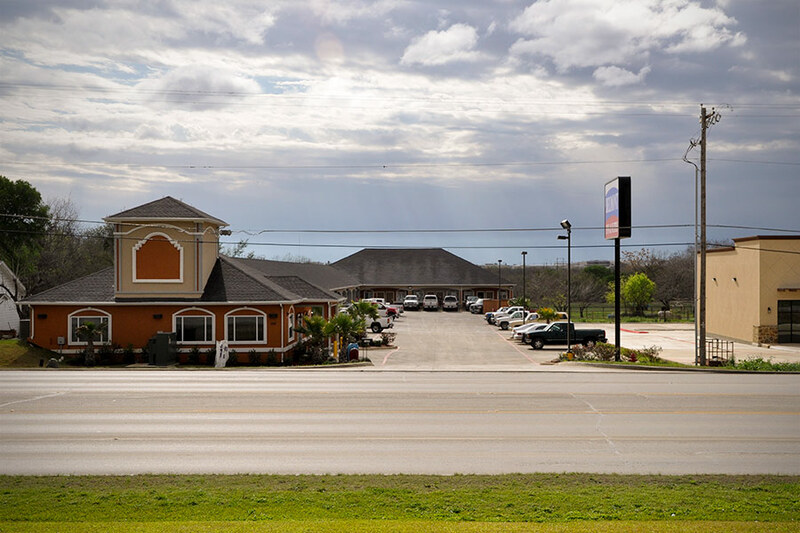 To make a long story short, in 2009, when the land officially hit the market, brothers Jerry and Maury Rubenstein, owners of Texas Pipe and Supply Company and residents and civic supporters of Bellaire since the 1980s, quickly began negotiating with the Teas family before they could sell to another developer. The Rubensteins and the Teas came to an agreement to sell the acreage to the Jerry and Maury Rubenstein Foundation for an undisclosed sum with the intention that it would eventually become a public park named in honor of their mother, Evelyn Rubenstein. In 2011, the Rubenstein family created Evelyn’s Park Conservancy, a 501(c)(3) non-profit organization with a board made up of members appointed by Bellaire City Council and the Rubenstein Foundation, to administer the park and coordinate its delivery to the city. The Rubensteins and the Bellaire City Council each gave $100,000 as seed money to Evelyn’s Park Conservancy to begin planning. 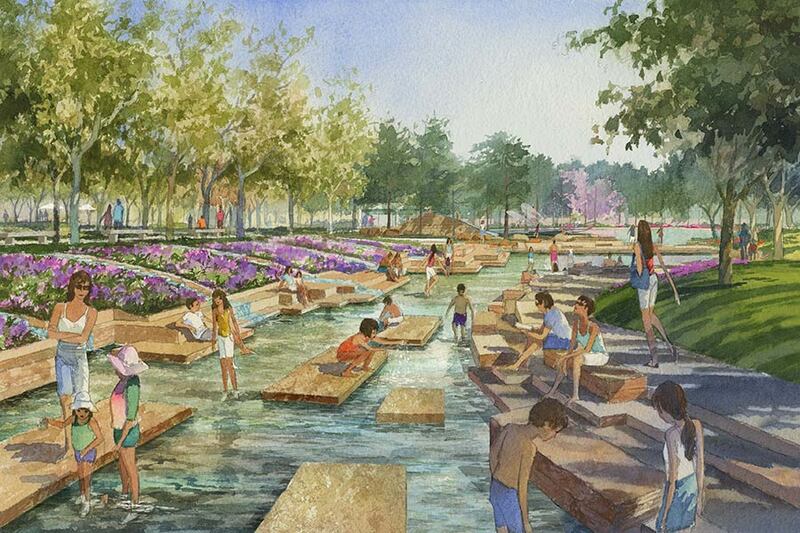 Later that year, Houston-based landscape architecture firm SWA Group, along with San Antonio-based Lake|Flato Architects, were hired to design the park and supporting buildings. The design for Evelyn’s Park includes a great lawn, a monumental shade structure, a creek and lake, as well as a café and event space. The scheme for Evelyn’s Park is typical of the program-heavy small urban park model that was inaugurated in the 1992 rehabilitation of New York’s famously decrepit Bryant Park by Hanna/Olin and Hardy Holzman Pfeiffer. In the Houston area, this model has been used extensively, notably for Discovery Green in 2008 and Market Square Park in 2010. The SWA and Lake|Flato design transforms the oldest of several Teas family houses that once existed on the property—a two-story wood-framed bungalow ordered from a Sears catalog and built in 1910 as Edward Teas’ own residence—into a café. Directly behind the café is a barn-like annex that can be rented out for additional income. Behind it is the main parking lot. Just east of the café complex is a “stream fountain” that mimics, in miniaturized form, the many bayous that snake through Harris County. It drains into a small lake at the rear of the park. The lake faces a “Great Lawn” that extends almost to the park’s southern boundary at Bellaire Boulevard. 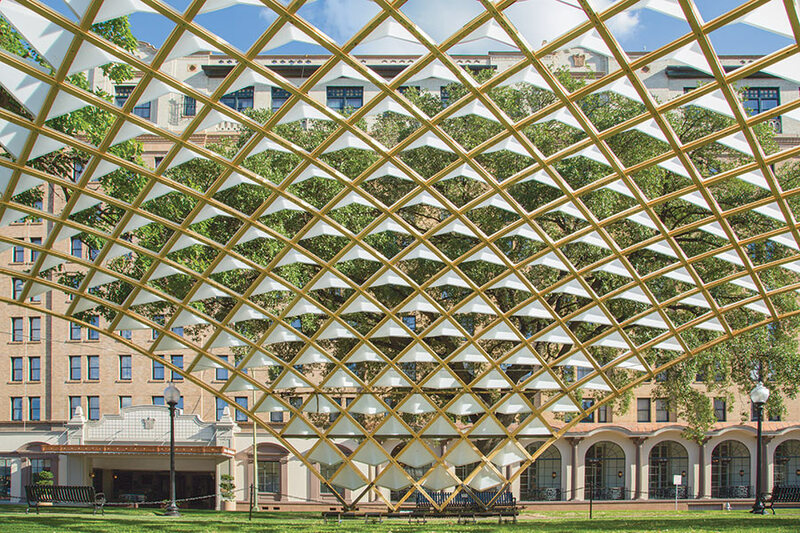 This end of the lawn is demarcated by what the architects call the “Trevillion” (trellis + pavilion), a 200-foot-long, gently curved, steel framed pergola that is intended to be the park’s landmark. 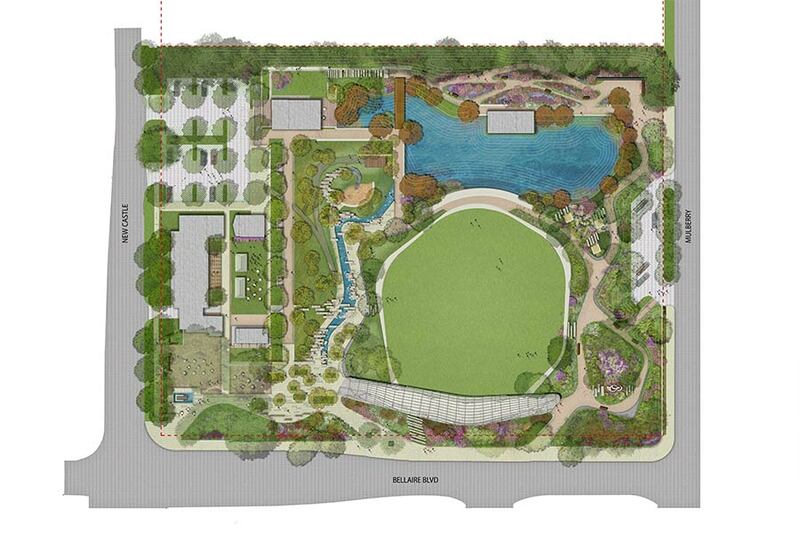 In addition to these features, there is a small plaza and water feature in front of the café, a children’s garden and play area, butterfly gardens, a donor wall and donor plaza, a bog garden, a memorial garden for Evelyn Rubenstein, and a “native restoration buffer” planted along the northern boundary of the park to screen views of the Lovett Homes houses. 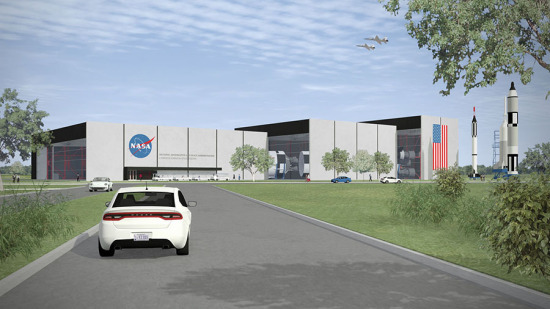 Phase 1 site plan (left) and the full build-out plan (right). 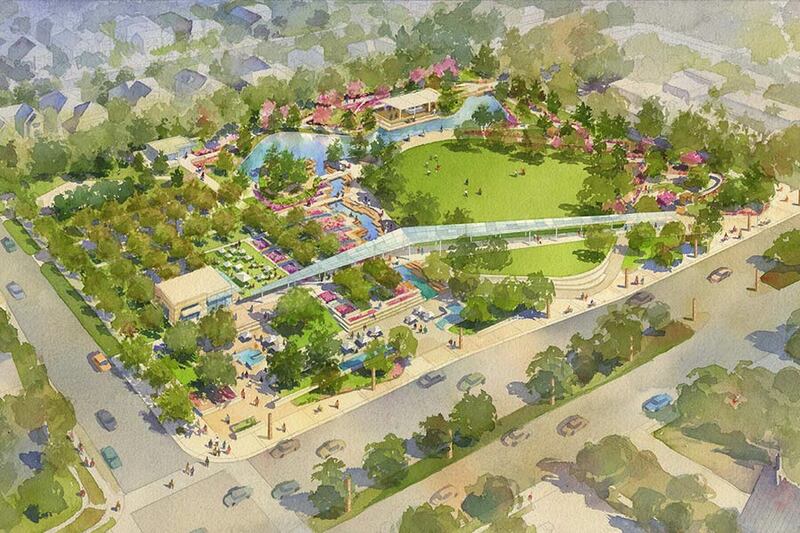 After the schematic plan was approved by City Council in 2012, the citizens of Bellaire overwhelmingly supported a $5 million bond for improving the park site in November 2013. Although this is generous, it is not quite a third of the park’s total $16.5 million estimated budget. Construction will be completed in stages. 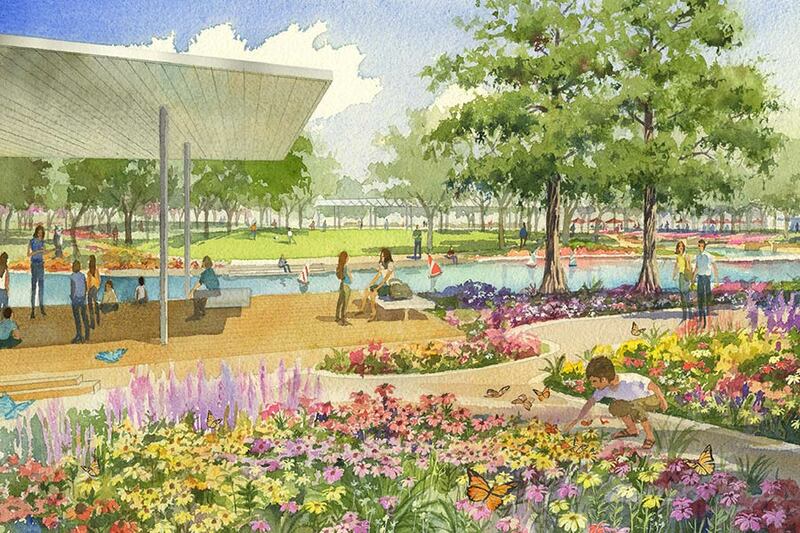 The $4.9 million phase one omits the stream fountain, the lake, and the trevillion, but includes the café complex and great lawn. Julian Castro, the former mayor of San Antonio, was sworn in Tuesday as the country’s next Secretary of Housing and Urban Development. Castro succeeds Shaun Donovan who was tapped to head the Office of Management and Budget. During Donovan's tenure at HUD, he oversaw the Rebuild by Design competition, which selected its winners earlier this summer. Among his many responsibilities in his new role, Castro will likely be heavily involved in the execution of those projects, which include work from BIG, SCAPE, Penn Design/OLIN, OMA, Interboro, and MIT. 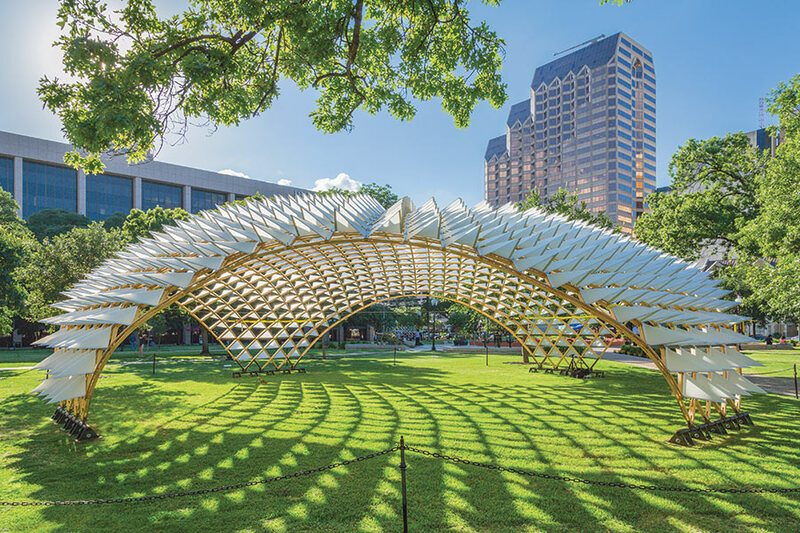 This summer, San Antonio’s Travis Park—a newly revitalized green space originally established as Travis Plaza in 1870—is playing host to an architectural installation by 14 graduate students from the UTSA College of Architecture. F2, as it is called, is a grid shell prototype that spans more than 50 feet with only 2 inches of material thickness. It evolved from a research project studying minimal surfaces, inflatables, branching, cellular structures, and centenaries. 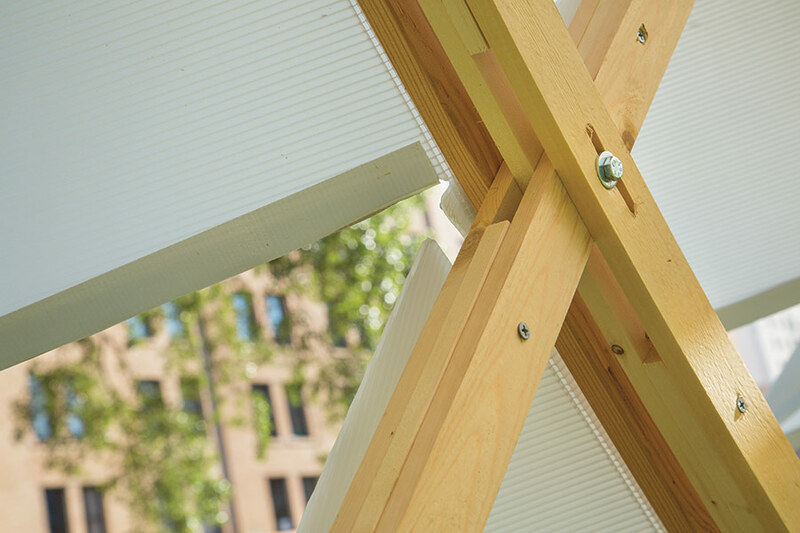 F2 is made from 4,800 linear feet of ½-inch-by-2-inch spruce timber sections and 760 CNC cut Coroplast folded panels. The assembly is bolted together into a grid shell with more than 1,000 galvanized nuts and bolts and 2,600 washers. The footings are water jet cut from ½-inch steel plate, welded, and attached to 30-inch screw piles. It took two weeks to fabricate the individual parts and the graduate students installed it in five days with the help of 13 volunteers. 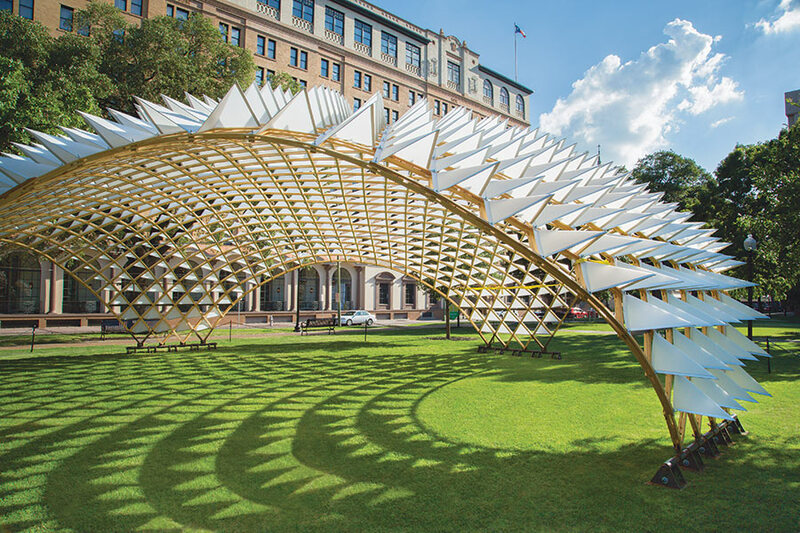 The project was designed and fabricated under the direction of Andrew Kudless, Director of Matsys and the 2014 Dean’s Distinguished Visiting Critic at UTSA, and Kevin McClellan, Co-Director at TEX-FAB and lecturer at UTSA. David Shook of SOM San Francisco provided structural design support during research and Datum Engineers did the final design engineering. 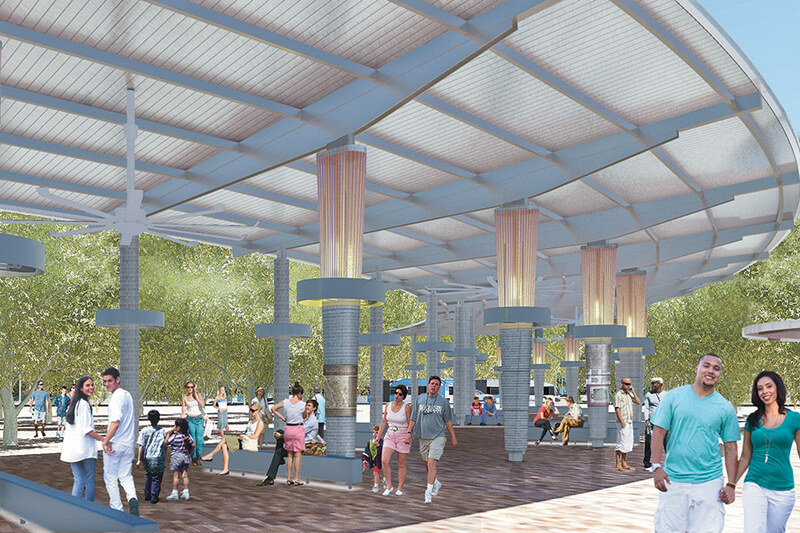 The architects hope the new transit center will activate the western end of Downtown San Antonio. 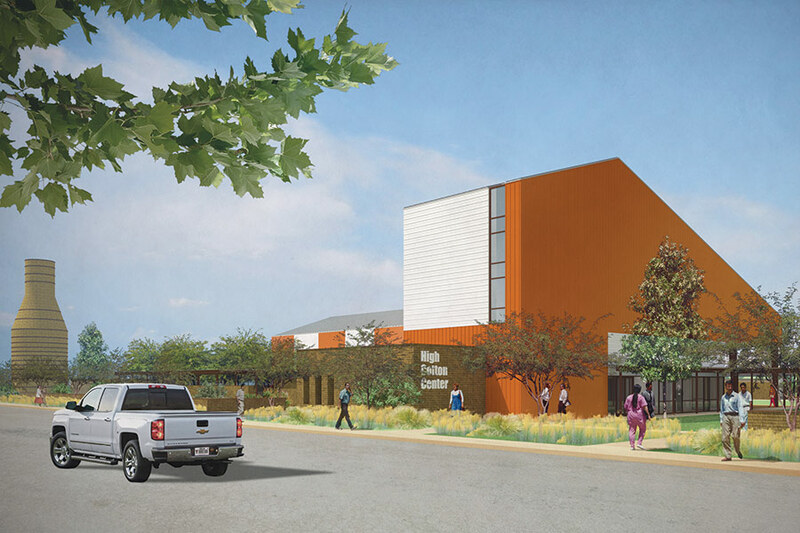 In late June, the board of directors of VIA Metropolitan Transit in San Antonio, Texas, approved plans for the Westside Multimodal Transit Center at the corner of Frio and Houston streets. The city hopes that the project, which broke ground on July 14, will spur development in this somewhat sparse and dilapidated area just west of downtown. 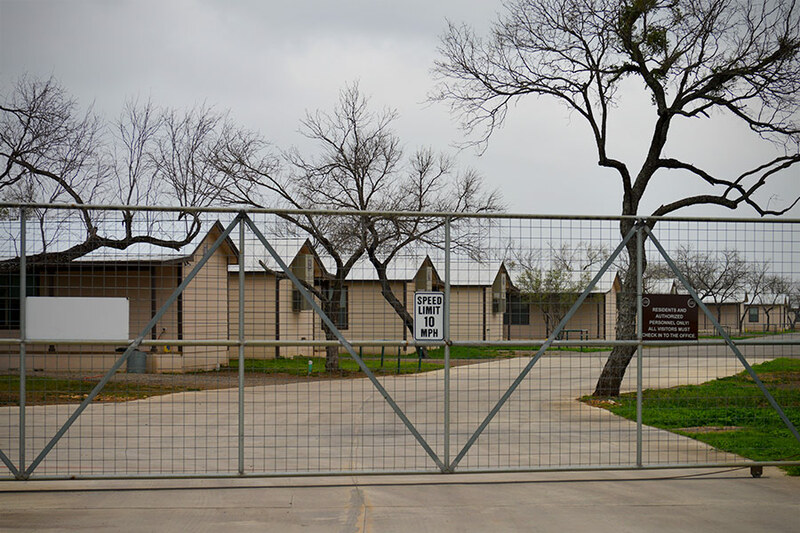 The neighborhood is currently home to such differing facilities as a University of Texas at San Antonio campus and the Bexar County Jail. 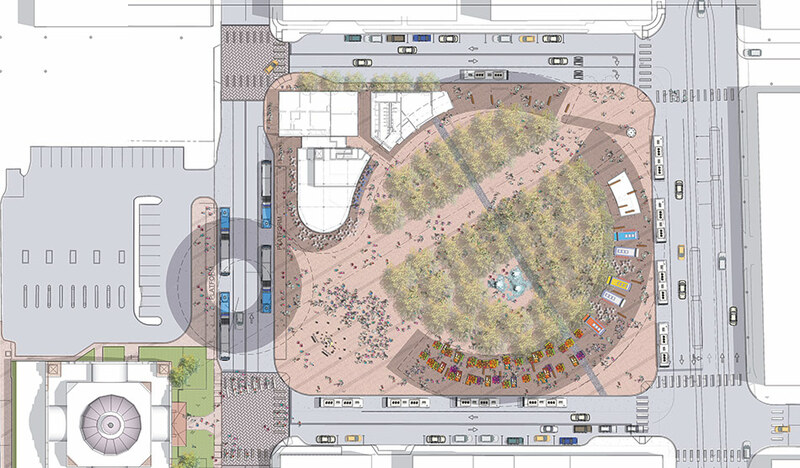 Designed by New York City–headquartered EE&K, a Perkins Eastman company, with local help from architecture firm Ford, Powell & Carson and landscape architecture studio Bender Wells Clark Design, the transit center taps into San Antonio’s rich history of urban squares. It will service the city’s growing network of city bus and VIA PRIMO bus rapid transit service, expand its B-Cycle bike share system, and may accommodate future rail service as well. 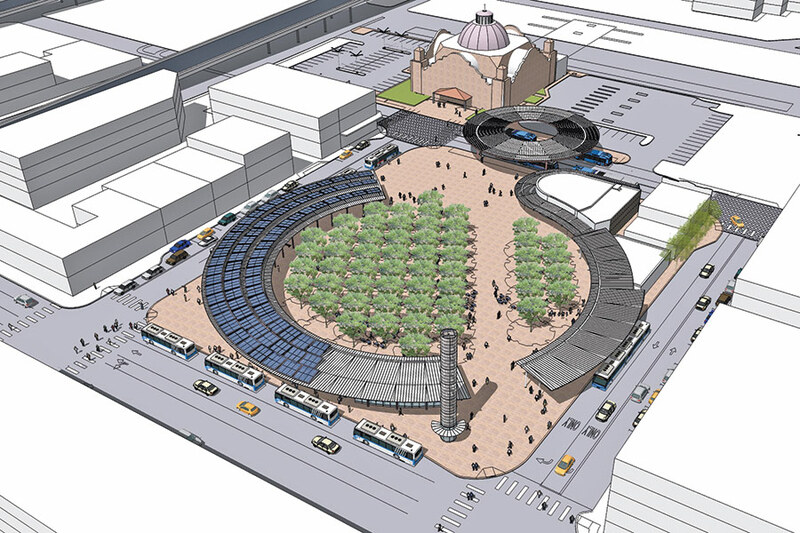 The design of the transit center takes its cues from the adjacent International–Great Northern Depot (1908), a historic train station designed by Harvey L. Page in a fantastical Spanish Mission style, which was converted into a bank in the 1980s. 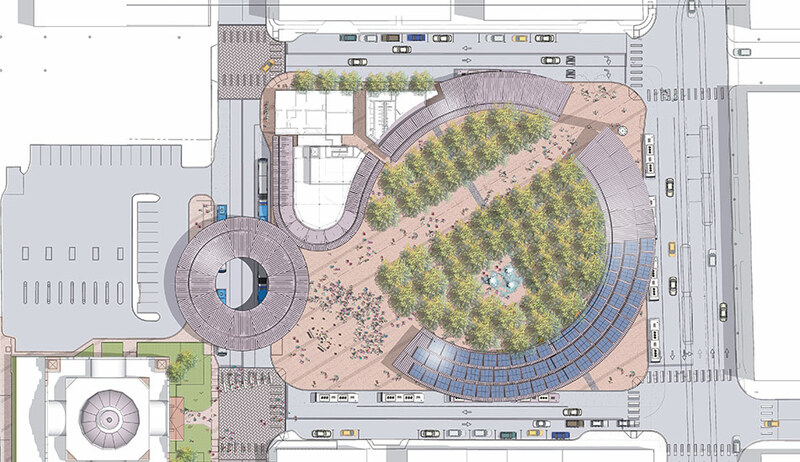 The depot’s circular dome, as well as the turning radii of busses, inspired the circular, 20-foot-high canopy that rings the site. 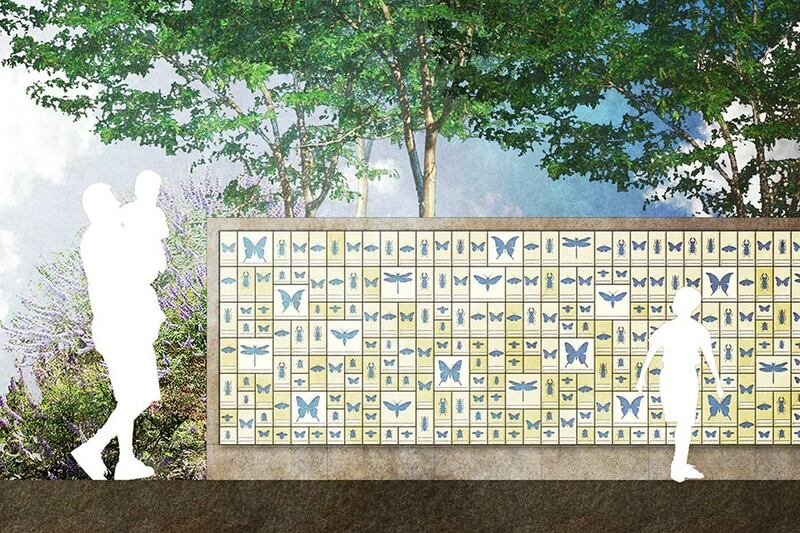 While primarily composed of a simple palette of structural elements, the design team added tile mosaics to the column covers, “to add a little more beef, so there’s something to look at,” said Eckstut. 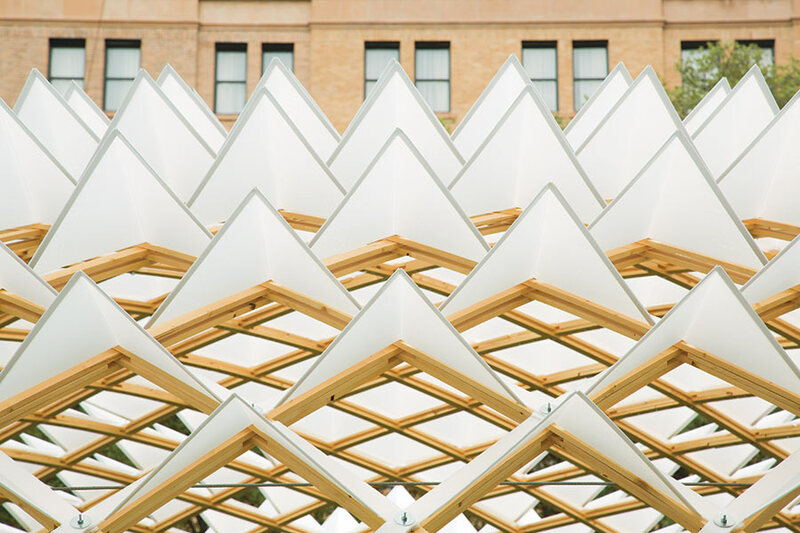 The canopy is topped by a photovoltaic array that will generate much of the power needed to light the project. A stand of cedar elm trees fills the expansive interior of the 90,000-general-square-foot plaza. Permeable pavement and an underground retention system control stormwater runoff. 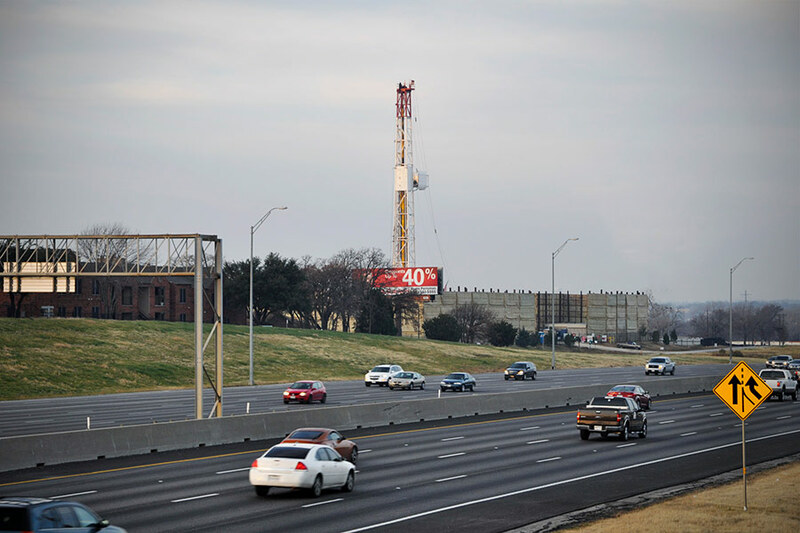 A light tower installation by San Antonio artist Bill Fitzgibbons is planned for the plaza entrance to make it easily discernible from long distances. 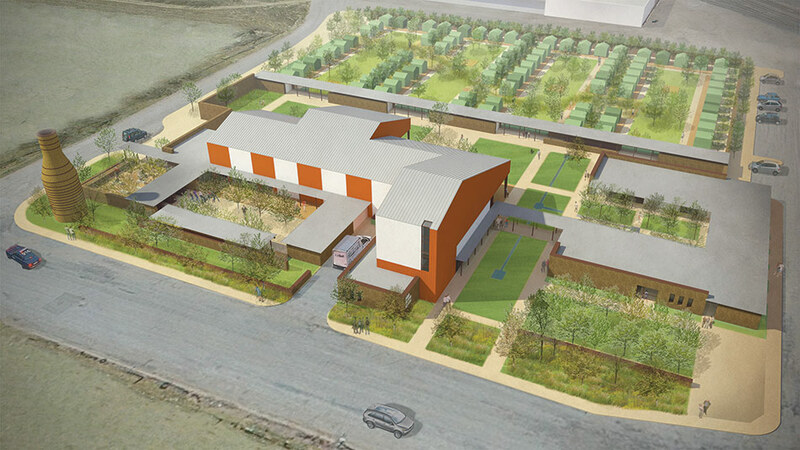 At the end of March, faith-based non-profit Link Ministries and Urban Tech, the downtown studio of the College of Architecture at Texas Tech University, announced plans for High Cotton Genesis, a homeless assistance facility on the 5-acre site of a former cotton gin in Lubbock, Texas. Designed by San Antonio architecture studios HiWorks and Urbanist Design and Dallas landscape architecture practice Studio Outside, the master plan provides a framework for phased development of new service buildings and a chapel, the adaptive reuse of existing agricultural structures, and landscape elements that will soften the harsh West Texas environment. High Cotton has already been in operation on the site for three years in a military-like array of tents, which has become known as “Tent City.” It was set up after the Lubbock City Council made it illegal for the homeless to occupy the city’s central library as a 90-day assistance program geared toward helping the housing impaired to get back on their feet, find a job, and move into their own residence. “We came at it not trying to be nice to anybody, we were just trying to get them out of downtown,” said Urban Tech director David Driskill. Link Ministries, which owns and operates several community centers in former cotton industry buildings in the area, donated the property. 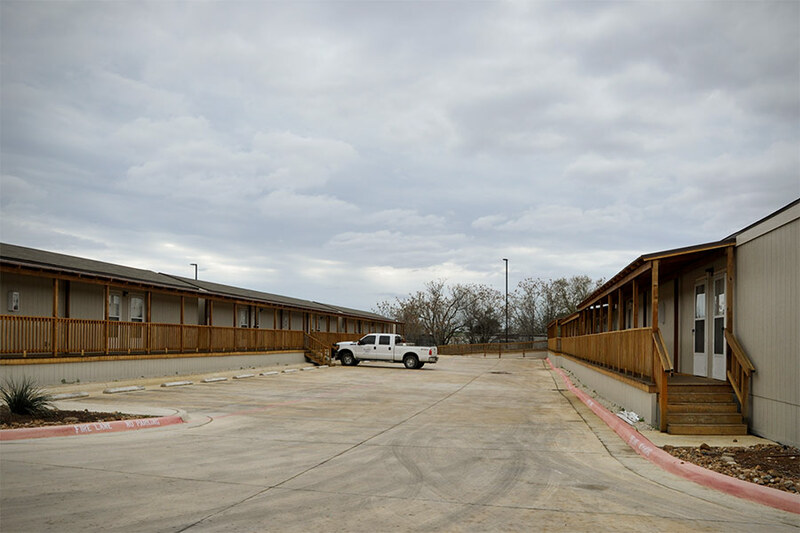 The facility—the first of its kind in Lubbock—turned out to tap quite a need. “Every day I get at least one call from a potential resident that I have to turn down because we’re at capacity and have a waiting list. It’s a good sign that our services are helping people in the community, but it’s also a sign that it’s time to grow,” said Link Ministries director Les Burrus in a statement. To determine how best to improve the project, Link Ministries and Urban Tech formed an advisory group (the High Cotton Core) and held an information gathering session in January 2012. In the fall of that year, Lake Flato Architects led a design charrette with the High Cotton community to further flesh out a vision for the site. 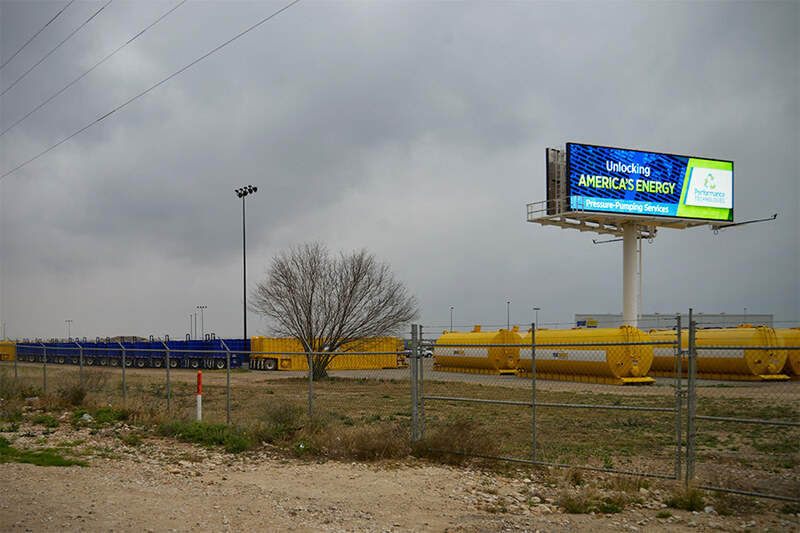 In fall 2013, the stakeholders reached out to the design team, inviting them for a two-day site visit and two more charrettes. 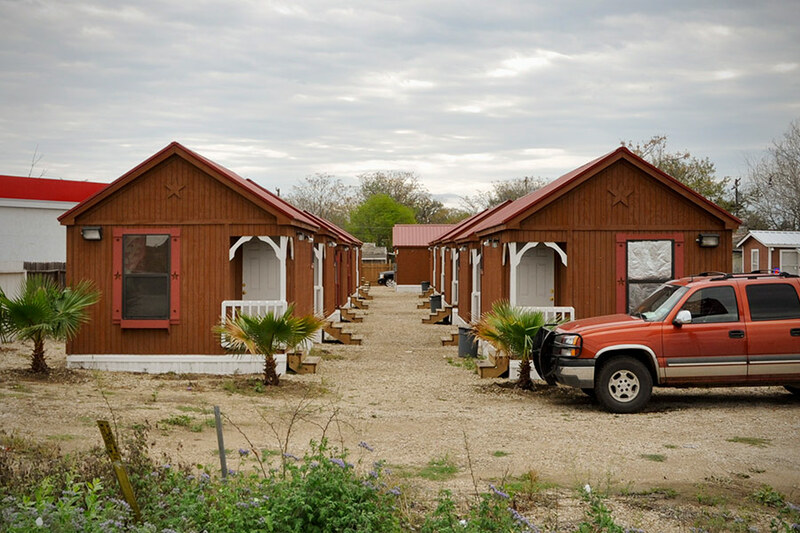 In order to get a better idea of the experience of residents, Brantley Hightower, founder and principal of HiWorks, spent a night in Tent City. 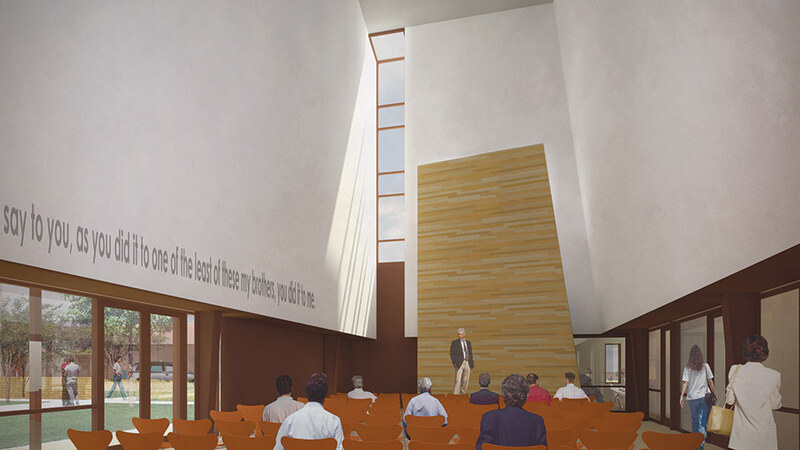 The most prominent architectural aspect of the project is the chapel, a 45-foot high extension of the existing cotton gin building, which will become a landmark in the flat landscape. The lower-slung service buildings and a perimeter wall, based on a Spanish Mission precedent, are planned to be constructed from rammed earth. 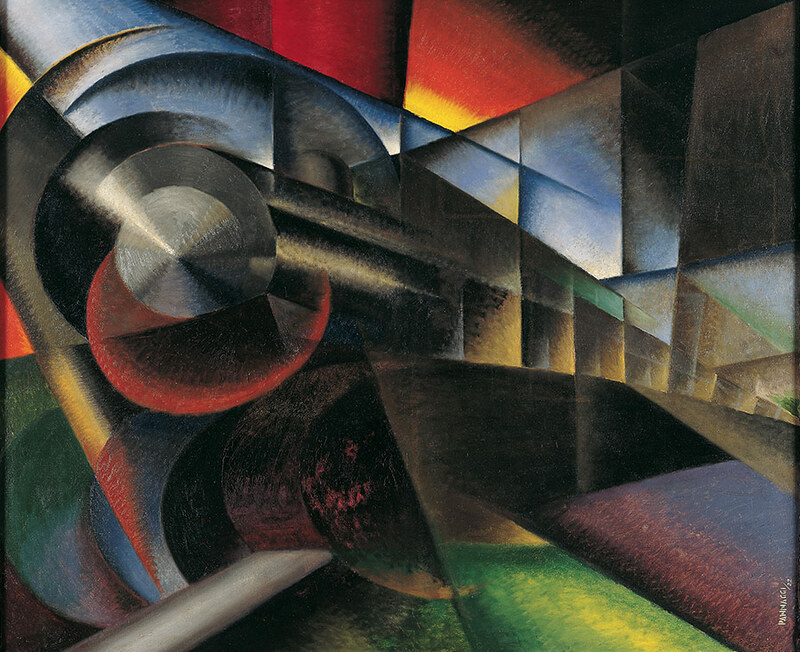 Speeding Train (Treno in corsa), 1922, Ivo Pannaggi. There is a playful perversity in celebrating an artistic movement that called for the destruction of “museums, libraries, academies of every sort…” with a monumental exhibition on Fifth Avenue. Italian Futurism 1909–1944: Reconstructing the Universe, on view through September 1 at the Guggenheim, takes an ungainly collection of painting, prints, sculpture, ceramics, fashion, and writing and tames it into a lively narrative about a curious strain of early 20th century radicalism that aimed to bully its way to utopia. Later reviled—sometimes unfairly, writes art historian Enrico Crispoliti in a catalogue essay—for its associations with Italian Fascism and a misogynistic point of view, Futurism began as a literary movement spearheaded by the poet and editor F.T. Marinetti. In his original 1909 manifesto published in the French newspaper Le Figaro, Marinetti provocatively paid homage to war and speed, the former as a transformational force in society and the latter as a new aesthetic standard for modernity. Marinetti’s medium was the written word, but through the years he gathered a motley, multidisciplinary crew under his tent, including poets, musicians, artists, and architects. The Italian movement, which emphasized plastic and dynamic forms, unfolded parallel to Cubism in France and was soon influenced by it. Umberto Boccioni, one of the better known artists from the movement’s so-called “heroic” early period, is well represented in the exhibition, as is the young architect Antonio Sant’Elia. A fascination with the infrastructure of transportation and communication shines through in Sant’Elia’s drawings of sleek, streamlined high-rises in his Città Nuova series, and his drawing Station for Trains and Airplanes looks like it may have come from the pages of a 21st century newspaper. Killed in 1916 in World War I, Sant’Elia’s involvement in the movement was brief and on paper, although his name lived on as the title of a Futurist journal. 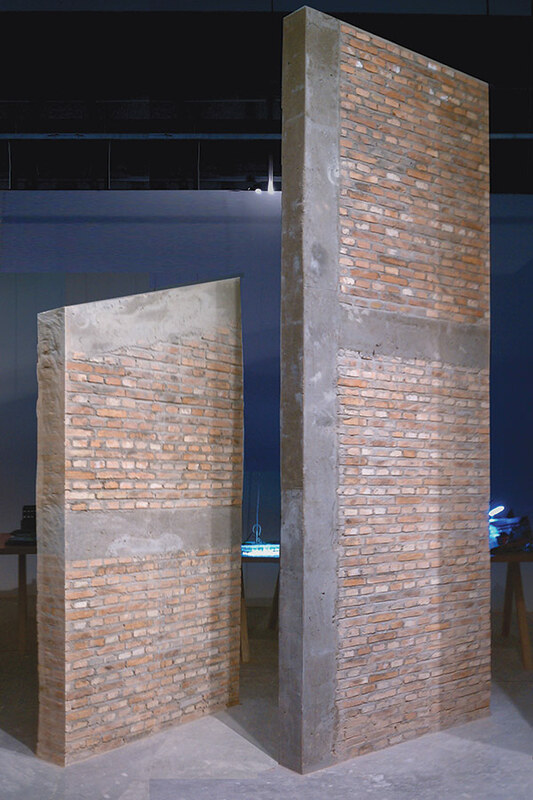 Work of Sant’Elia’s contemporary Mario Chiattone, who was never formally part of the Futurists, is also included in the show, along with that of architect Virgilio Marchi, whose dramatic sketches for city plans with flyovers and floating walkways for the island of Capri—a Futurist outpost—evoke modern day Hong Kong. The surprise star of the exhibition is Fortunato Depero, an artist and graphic designer who notably proclaimed in 1931, “The art of the future will be the art of advertising.” Unlike the architects associated with the movement, Depero actually managed to build something, and his 1927 Bestetti Treves Tumminelli Book Pavilion made of giant three-dimensional letters, showcased in a striking 1:3 scale model in the show, seems to foreshadow the contemporary pop-up shop. Depero’s ads for Davide Campari underscore his facility at bringing Futurist aesthetics into the commercial realm, while his designs for toys, textiles, and waistcoats speak to the Futurist ideal of the opera d’arte totale, or “total work of art,” a concept more familiar to architects and designers in its German iteration, the gesamtskunstwerke. Like Gropius at the Bauhaus, the Futurists wanted to create a holistic environment. But if a movement so aggressively shuns the past, it is a challenge to create a way of living that does not refer to previous conventions. A Futurist tea set? A Futurist dining room suite? Both are represented, and it is at these moments in the show that Futurism almost feels quaint. At the Guggenheim, visitors may be tempted to zip to the top of the building via elevator then let gravity help pull them through the main exhibition. 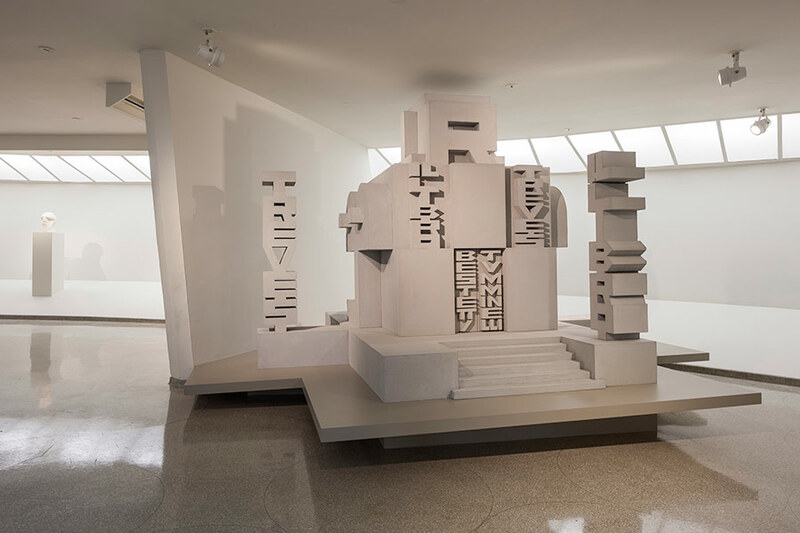 But those who trickle down through Italian Futurism will miss the full impact of the careful story that curator Vivien Green methodically builds during a forced march up the museum’s ramp. With the mix of media including archival publications of Futurist manifestoes (there were many) as well as videos that deploy sound and photographic stills, content and context become effectively blurred. The Futurists were a noisy bunch, declaiming their latest writings at serate, evening gatherings that often ended in a scuffle. The exhibition feels intentionally noisy, too, with an atmosphere of cacophony rather than contemplation. The message is that Futurism was meant to be experienced, not just observed. 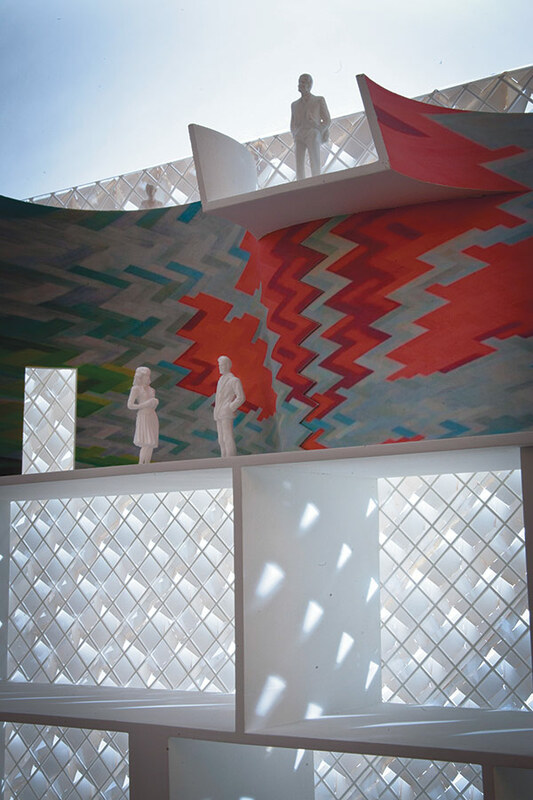 A side gallery dedicated to Futurist theater underscores this with a pulsating installation that evokes Giacomo Balla’s 1916–1917 lighting design for Igor Stravinsky’s orchestral composition Fireworks. Politics aside, this dedication to the disorienting and disruptive gives the Futurists particular resonance today, when the speed of cultural and technological change is taken for granted. The movement’s love of aerial perspectives generates some of the most electrifying later work, such as Tulio Crali’s 1939 Before the Parachute Opens, which graces the cover of the exhibition catalogue and could be a still from a modern day action movie. Seen from above, a black clad figure is silhouetted against the countryside just as he jumps from a plane. By comparison, the last gallery, featuring five large-scale painted panels by the artist Benedetta Cappa, one of the prominent female Futurists and later Marinetti’s wife, feels like a quiet coda rather than a conclusion. Based on the theme of communications, the 1933–34 public work was tucked away in a conference room in a post office building in Palermo. It is a reminder that with so few major commissions, the Futurists only come into focus today through massive efforts like Green’s at the Guggenheim. 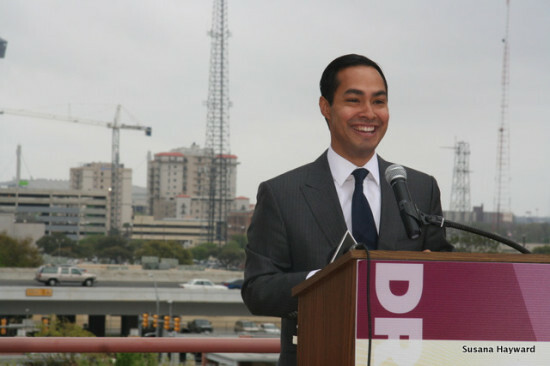 President Obama will reportedly nominate San Antonio Mayor Julian Castro to lead the Department of Housing and Urban Development. If confirmed by the senate, Castro will succeed Shaun Donovan, a trained architect, who has been at the agency since 2009. Donovan is expected to head the Office of Management and Budget. Since the news about Castro broke, there has been very little discussion about what this appointment means for the future of HUD. Instead, the Chattering Class has been entirely focused on what it means for national politics. And that is not surprising given that Castro is a “rising star” in Democratic politics. He gave the keynote address at the 2012 Democratic National Convention, is seen as a possible vice presidential candidate in 2016, and has been referred to as the "next Obama" in countless columns. Many political observers believe this nomination is a way for President Obama to increase diversity in his cabinet, and for Castro to build a national profile. 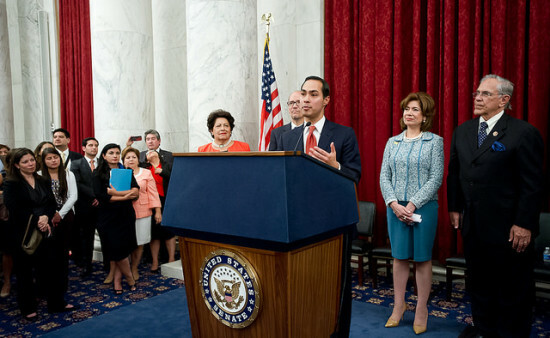 But back to the task at hand: What will Castro mean for the future of HUD? That is a hard question to answer because, again, this appointment is so wrapped up in politics. His background at the helm of a major Southwestern city brings its own distinct qualifications to the job. One possible glimpse into Castro’s legislative priorities is SA 2020, an initiative his administration launched in 2010 as a community-based approach to city planning. 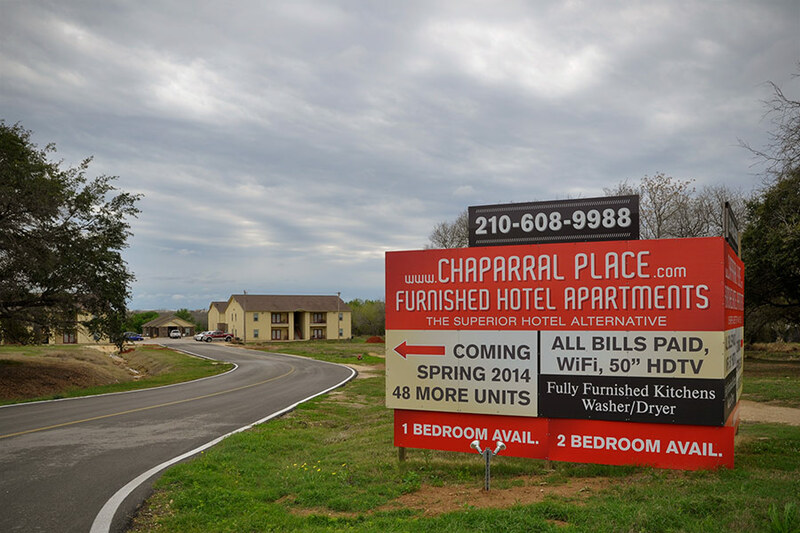 According to an SA 2020 progress report, by 2020, the city plans to add 5,000 new apartments downtown, reduce vehicle miles traveled per individual by 10 percent, and double attendance at cultural programs. As HUD Secretary, Castro will be tasked with setting somewhat similar goals, but on a much larger scale. Implementing any big plans, though, will be difficult considering the president has less than three years left in his term. 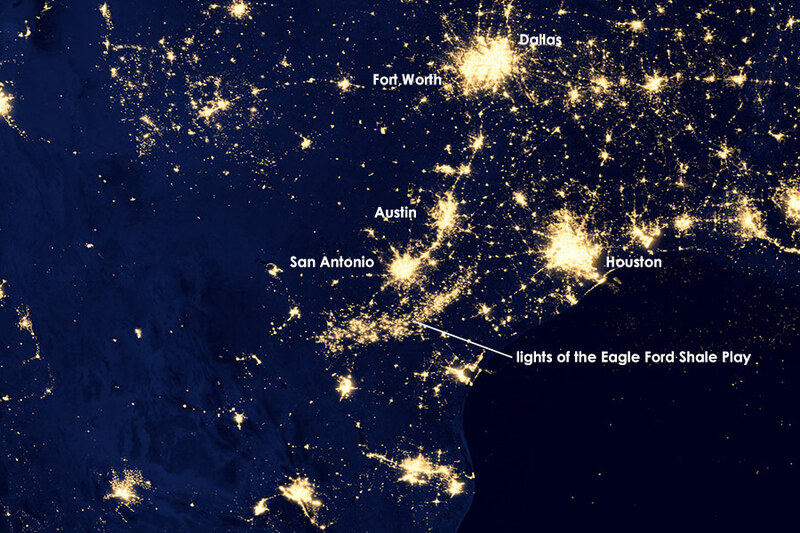 One immediately pressing topic on his agenda will be Rebuild By Design, a design challenge led by the agency to create a more resilient Eastern seaboard. AN recently reported that the competition's winner would be announced in the coming weeks. A possible change of leadership at HUD is not expected to change that. An official involved with Rebuild, who is not authorized to speak publicly on the matter, told AN "everything is moving as planned with full dedication and speed."